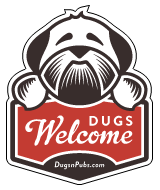 Visit our dog friendly pub in the East End of Glasgow and allow yourself to get lost in the soul of Kentucky! We have a beautiful beer garden (our hidden gem) and a specially designed dog menu from our friends at Pets ‘n Vets. We are open 7 days a week starting at 11am. We serve up Scotland’s largest selection of Bourbons, home smoked BBQ foods and a wide range of cocktails and beers. Dogs are always welcome.